The Andhra Pradesh Electricity Regulatory Board is preparing to cover the additional load. 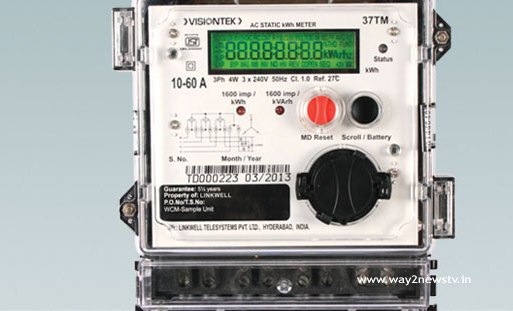 Currently household consumers electricity consumption is counting by smart meters. The bill is being generated if it shows to the meter screen. Additional loads will be taken into consideration when the more load is used during the month that it will be taken into consideration .with an additional load than one kilowatt loading, they will have to supplement the additional load. In this calculation, an average of 1.25 crore domestic consumers will have to pay an additional load per kilowatt, but revenues of Rs 700 crore per Kilowatt Rs 600 crore. Special inspection teams are going to enter the village level. Customers will voluntarily announce the current load in a month-long period of time, without being overlooked, checks and heavily penalties. The electricity bill is paying a current to the electricity consumers. He knew it only. How much is it when applying for connection? No one knows what has happened now. Usage increased. The bill increased. Users say it's the same cut. This question is still being asked. Customers are going to be overloaded with additional loads. In this calculation, every electricity consumed in the state will have to pay an extra Rs 1200 to Rs 3,000. According to official figures, an estimated 48 lakh poor people can burden an average of Rs 600. Two years earlier, the connections have been taken. At that time there were four bulbs, two fans, and electric appliances. One bulb is 100 watts .. Fan 70 watts. All the other accessories are combined, but the total use is no more than 500 watts. Considering these, the home loaded a load of one kilowatt. By the time the fridge, mixi, cooker, washing machine, water heater, geyer, AC, 1 HP motor .. In fact, all of this is being used to increase the current bill. As the current usage increases, the bills will increase with the name of the slabs. Finally, for ordinary and middle class families, Rs. The current bill comes out of 500. If the actual condition is like this, the load is taken to consider each device. Officials say that you have taken permission to load the kilowatt when you have a connection, and now use four kilowatt loading. It is the electricity bill. The same thing was done before the APEC.